One of my most pinned posts? This mason jar cookie mix. It solves so many “what do I make/give?” situations, and looks like it was a lot more work than it actually is. A win-win, for sure. I’ve been wanting to make a scaled-down version for a while now – one that uses pint instead of quart-sized jars – and came upon the perfect recipe to try. These sugar cookies are VERY forgiving, and don’t require any chilling of the dough. It’s a breeze for kids to roll out, and bakes up a small batch of perfect cookies every time. 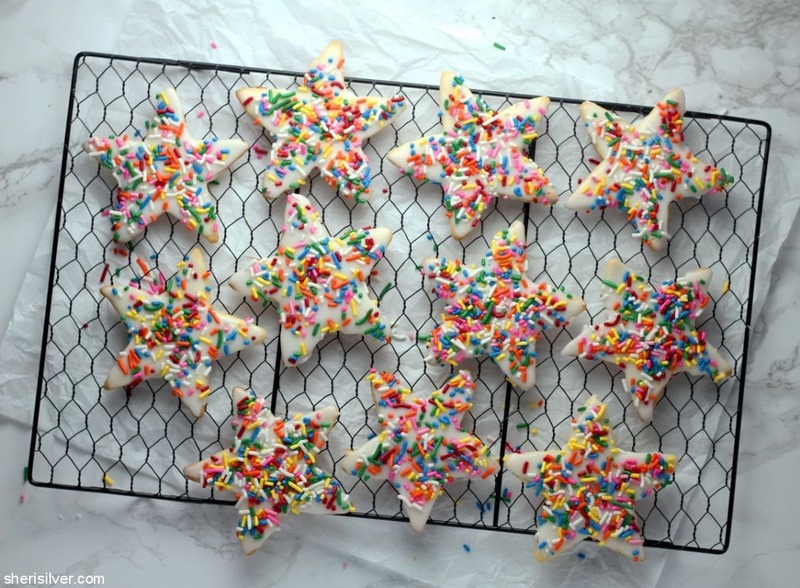 You can switch up the cookie cutter, and substitute the sprinkles for any toppings you like, making this a perfect idea for party favors, Valentine’s Day celebrations or teacher gifts! 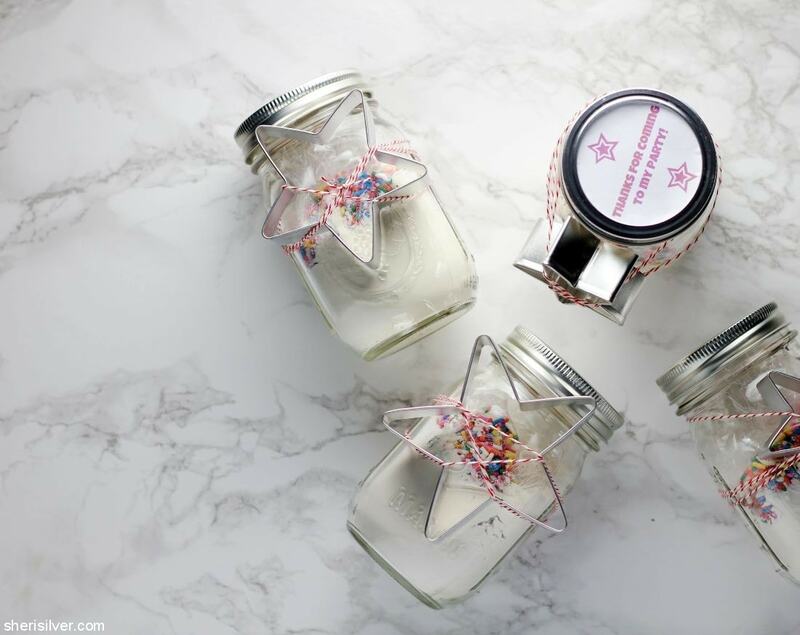 You can click here for the printable recipe to accompany the jars, along with the labels I created for the lids. And don’t forget to re-use that mason jar! Combine the flour, baking soda and salt in a small bowl – pour into your mason jar (I found a canning funnel to be VERY useful – especially since I was making a bunch of these! I got one for $2 at Chef Central). Pour the sugar and sprinkles into two separate baggies; add to the jar and seal. Use ribbon or twine to attach the cookie cutter to the jar. And here’s what you’ll need to make the cookies! Pre-heat oven to 350 degrees. Line 2 baking sheets with parchment paper. Carefully remove the bags of sugar and sprinkles from the jar; place the sugar into your mixer bowl. Add the butter to the sugar in your mixer bowl and beat till light and fluffy. Add the egg yolk and vanilla and beat again. Add the flour mixture and beat till just combined. Roll out dough between 2 pieces of wax or parchment paper, about 1/8″ – 1/4″ thick. Use your cookie cutter to cut out shapes. Gather scraps, re-roll and cut out more shapes. Place about 1″ apart on your cookie sheets (you can freeze for 5 – 10 minutes if your kitchen is warm and/or the dough seems very soft). Bake for 8 – 10 minutes, or till cookies are golden brown around the edges. Transfer to a wire rack set over a piece of foil; cool completely. Make the glaze by whisking the powdered sugar and milk together, adding more of each ingredient if necessary, till glaze is thick yet pourable. 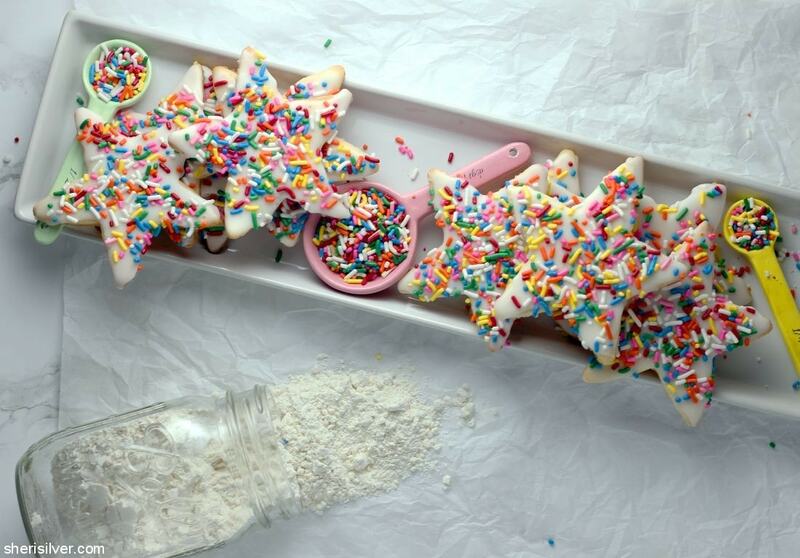 Place sprinkles in a shallow bowl or dish. Dip the top of each cookie in the glaze, allowing any excess to drip off. Return to rack and top with sprinkles. Let set completely before serving. Looking for more mason jar inspo? 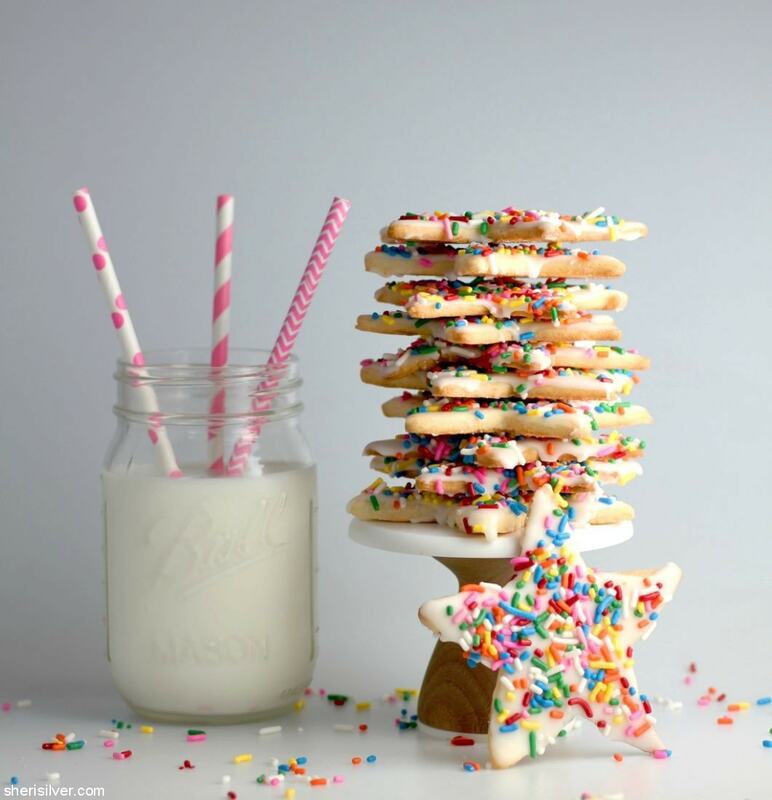 And you’ll find more foodie gifts, kid stuff and cookie recipes over on Pinterest!